Go Easy On Those Music Comparisons Between “Inside Llewyn Davis” and “O Brother, Where Art Thou?" 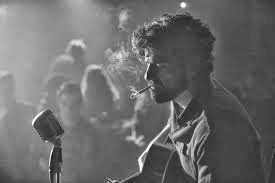 Oscar Issac as the fictional folk artist, Llewyn Davis. Having read several different reviews for the latest Coen Brother’s 2013 release, “Inside Llewyn Davis” (as well as having seen it), it’s safe to conclude that Joel and Ethan have done it once again; creating another highly successful mainstream Indie-feeling film. Indie-feeling based on the film’s smaller budget and scale, and the Coen’s typical non-formulaic approach to both story line and characters. “Inside Llewyn Davis” asks the viewer to make sense of a few days in the life of a very talented, but near penniless and self-destructive folk musician. A dreamlike film that at times is uncomfortably realistic, the Coen Brothers have also created a comedy that risks taking its humor a little too seriously. In other words, The Big Lebowski, it isn’t. But, it’s a wonderful film that meticulously recreates the place, time and folk music of the west village in New York City during the winter of 1961. Reviews from the New York Times, Washington Post, and Salon, to name a few, feel compelled to obliquely reference the Coen’s 2000’s “O Brother, Where Art Thou?” with its inspired use of appropriately placed country and folk songs that also evoke time and place - in this case, the state of Mississippi in 1937. (The music for both films tracks is produced and arranged by T-Bone Burnett). 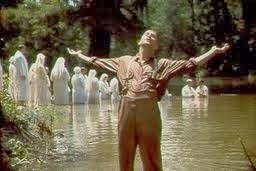 Tim Blake Nelson finds salvation as the baptismal choir sings "Down To The River To Pray" in "O Brother, Where Art Thou?" Certainly, there’s a comparison to be made between the two films. “O Brother, Where Art Thou?” is the Coen’s loosely-based, sunny and often hilarious tour-de-force of Homer’s Odyssey. George Clooney’s main character (Ulysses) escapes prison with two fellow inmates (played by John Turturro and Tim Blake Nelson), in pursuit of great treasure, the location of which is known only to Ulysses. In contrast, Llewyn Davis has a muted and depressing roundtrip journey to and from Chicago in search of glory and riches (well, hopefully enough riches to rent his own place). An orange tabby cat - who Llewyn feels obliged to adopt and carry with him as he bums his way around the village and subsequent travels to Chicago – is also named Ulysses. Musically speaking, the most compelling similarity between the two films (in addition to the inclusion of period American popular music), is that so much of the period music in both films is performed and sung in real-time, with a few renditions even going beyond a couple of minutes in duration. Beyond that however, the two films use their period songs for different dramatic purposes, resulting in a contrasting dynamic. “O Brother’s” Blue grass, country and folk songs are mainstream and culturally ubiquitous, ingeniously supporting scenes for baptisms, political rallies, an encounter with seductive sirens (an Odyssey reference) - even a Klu Klux Klan rally. In fact, only the song “I Am a Man of Constant Sorrow”, spontaneously recorded by the soon to be very popular, Soggy Bottom Boys, is the only music actually used as a plot device, or part of the story. The music in Llewyn Davis, however, is not mainstream, and representative of the 50s and early 60s folk counter culture. Scorned by other musicians (such as John Goodman’s pompous and bloviating jazz musician), Llewyn struggles against selling-out when offered an opportunity to become a third wheel in a newly formed folk trio (a clear reference to Peter, Paul and Mary). But perhaps the most important distinction between the two films is the casting coup that gives us Oscar Isaac as the forlorn Llewyn Davis. Mr. Isaac not only beautifully conveys Lleweyn’s anguish and ambivalence, but is actually a very accomplished singer and folk guitarist. The Coens have allowed him to perform live before the camera, something we suspect (despite their faultless lip-syncing) George Clooney, John Turturro, or even the Grand Wizard of the KKK (embodied by Wayne Duvall) are unable to accomplish - live or otherwise. (In all fairness, Tim Blake Nelson, provides his own signing). Conversely, where “O Brother” showers the audience with a colorful array of different vocal groups, Llewlyn Davis performs a solo (and as we soon learn), lonely folk act. When Mr. Isaac as Llewyn Davis opens this film singing “Hang Me, Oh Hang Me” sitting on the stage of an actual, West Village folk club, the Gaslight, he and the Coens seamlessly evoke a poignant trifecta of time, place - and character. 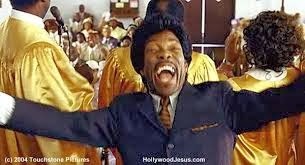 (In passing, and in the same context, it’s worth drawing comparisons with the Coen’s 2004 film, “The Lady Killers”, which liberally uses African American gospel music). 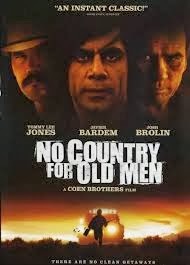 But, "No Country For Old Men" had no music on its soundtrack, whatsoever.